I’ve been learning Arabic now for over 4 years. 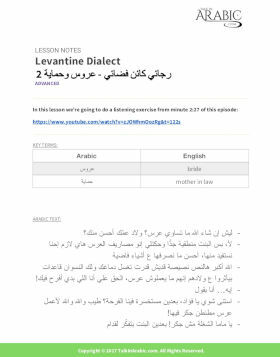 Most of that time has been spent learning Levantine Arabic (specifically Syrian) but I’ve also spent quite a bit of time with other dialects like Egyptian and Moroccan. Finding good quality learning material for spoken Arabic is really tough – most of what you find online is for Modern Standard Arabic (textbook Arabic). Talk In Arabic was/is the first attempt that I’m aware of to try and solve this problem. Over the years they’ve amassed a trove of resources from 8 different major dialects and put it all together in one place as part of a subscription service. 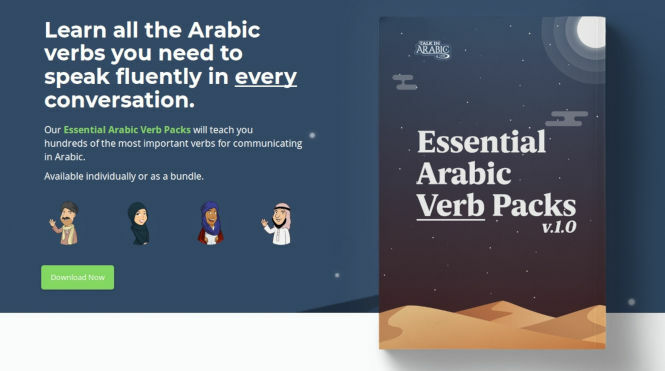 Donovan recently gave me full access to Talk In Arabic, including the Essential Verb Pack addons for Egyptian, Levantine, Moroccan and Saudi, and asked me if I’d go through the content as thoroughly as possible, providing a no-holds-barred review. As someone who’s tried a lot of different resources and types of resources for Arabic, I feel like I know what works and what doesn’t. I’m not going to spend much time going into what’s in the Talk In Arabic dashboard. You can already access that for free and see what’s in there (but it’s locked without a subscription). It’s a pretty straightforward navigation: You have a main dashboard area and then subsections or dialect-specific dashboards access via the sidebar. Each dialect section can be navigated by selecting a level (Beginner, Intermediate or Advanced), videos, vocab or numbers. This will filter the lesson content on the main page. You have the lesson (either a video or audio bar), a button for downloadable lesson notes and MP3’s, and a comment section where teachers routinely respond to questions. The videos all have subtitles in Arabic and English that can be toggled. For audio lessons, most of them have a podcast-feel to them (a presenter just chatting and explaining a topic) or a selection of words and phrases followed by the English. There are also some vocab lessons that are simply images and audio buttons to listen to the name of the object in Arabic. It’s a very easy-to-use interface and it’s clearly been designed professionally. One thing that might help is adding the contents of the lesson PDF to the page so that I don’t have to download the lessons each time. Other than that, I think it’s great. So this is the first issue I noticed. 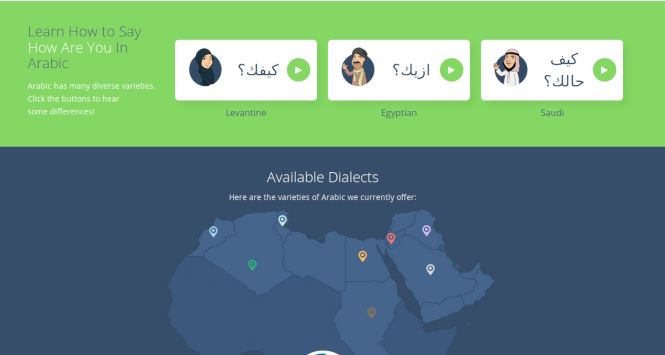 There are 8 dialect sections on Talk In Arabic: Egyptian, Levantine, Iraqi, Saudi, Algerian, Moroccan, Tunisian and Sudanese. But they’re not all the same. 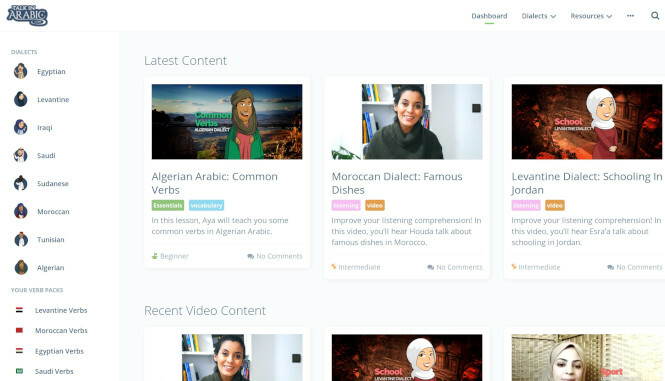 You’ll find for example that Saudi and Sudanese have less content than Egyptian and Levantine (less videos and audio lessons). I expected that they would all follow the exact same trajectory. There is a TONNE of Levantine content but much less Sudanese. For a long time we were keeping every dialect at the same identical level but due to popular demand, we chose to really ramp up our popular dialects (e.g. Egyptian and Levantine). Literally tens of thousands of members joined and the overwhelming majority were learning one of these major dialects. So we put our time and effort into making sure that those sections were taken extra special care of and full of content. We didn’t disregard the other dialects but we just wanted to make sure that the most important ones were getting extra attention. Now that we’re in a better position and have hired more teachers, we’ve begun to catch the other dialects (especially Maghrebi dialects) up to main ones. This makes sense but my only thought was that in the meantime, the other dialects could be offered at a reduced cost until they’re caught up. I’m assured that it won’t be long before every dialect is identical in terms of structure and content. There’s still some great material in these sections but I can’t wait to see them fill out and reach the same level as say, Levantine. Without a doubt, whenever we receive an email from a person who is unhappy with our service, almost 100% of the time it’s because they “thought it was a course”. Whether we’re not making it clear enough in our advertising or our affiliates aren’t being clear about it, we’re not sure. But usually it’s because of wrong expectations from brand new learners not being met. This makes sense. It’s in the FAQ. I can see how some people who are expecting a linear course might be confused when signing up. For people like me who are serious learners of Arabic and know what we want, the value is clear as day. Personally, I like the freedom it offers in providing material that I can use however I want. It might be better if Talk In Arabic explains clearly that they’re not a structured course provider (like Rocket is for example). One of the things I learned talking to Donovan (and they really should emphasize this more on the site) is that Talk In Arabic employs refugees (mostly). The lessons, recordings and videos are almost completely made by people who fled from the Syria/Iraq conflicts for example, Sudanese and Saudi asylum seekers, and other disadvantaged families in North Africa. I’m told that this is not always the case but they really try to prioritize these people. Unlike some other services that seem to exploit foreign labor for language material, Talk In Arabic pays these families wages that are even higher than the American standard. To me this is a really special thing their company does that I haven’t seen talked about anywhere. It’s good knowing that subscriptions are actually helping people. There are 4 different dialect verb packs offered as addons to the subscription (about $20 each or included free as part of the Lifetime subscription). Each verb pack includes around 200 of the most important verbs and 3200 individual conjugations. The audio library is fantastic and well-arranged and it covers all the most important verbs you would need for most conversations. The booklet needs to be updated and made easier to reference. I feel like they could have made the booklet longer and given each verb its own page with some kind of hyperlinking content list so you can jump straight to the verb you need. There’s also definitely room for some added verb forms or usage examples. They’ve told me that this is something they’ve been working on recently (including some kind of interactive option) so maybe we should expect an updated version of these packs soon. One thing I found peculiar and had to ask about is that there are two very different kinds of lesson notes on the site. There are some downloadable PDF’s that still have a copyright from years ago on them and are just Arabic transcripts with translations (clearly outdated). But then there are brand new lesson notes that are copyrighted this year which are professionally designed and detailed (vocab lists, grammar notes, transcripts, etc.). After talking to Donovan, apparently they’ve been remaking and removing old lesson notes from when the site first started but it’s a big process. They’re gradually removing the outdated stuff and replacing it with fresh material. So based on the new lesson material they’ve made, the quality is definitely professional and it’s clear a lot of work has gone into their production. It seems that a lot of the beginner content has transliteration included but the higher levels do not which makes sense. At the time I’m writing this, there are a few different options when you sign up to Talk In Arabic. First of all, there’s a monthly subscription priced at $15. This includes access to everything except the verb pack addons which are then an additional $20 each on top of that. At various times, this price has come down to $9 per month (it seems to be a sale thing) but not often. Then there’s a $126 per year option. This provides the identical same content as the monthly but shaves $54 off the cost if you were to pay $15 per month for a whole year. Other than saving some money, there are no added features with this plan. Finally, there’s a Lifetime option (which I think is a better overall deal than the yearly). It’s $197 but this includes all Essential Verb Packs for free ($80 value) and is a ‘pay once, own it forever’ plan. The way I see it is that the site has changed a LOT in the past 2 years and added lots of new stuff so the Lifetime option would guarantee you can come back much later and still have access to everything (and who knows, the pricing could go up over time as the site expands). My only criticism is with the yearly plan – I just think there should either be more value added or reduce the price a little more. Talk In Arabic really tries hard to keep language “authentic” and natural. That also means that you don’t find slow recordings. This doesn’t bother me at all but I know some people prefer slow articulation. I guess the good thing is that the recordings all have transcripts and the videos are subtitled so you can read along, pause and repeat. I have to say I love Talk In Arabic both as a platform and as a concept. As it stands, there is nothing even remotely close when it comes to what they’re doing for Arabic learners like me. Finish upgrading all the old lesson notes to the new format. Update the Verb Pack booklets and add a few more verb forms in there. Balance out the content more so that the less popular dialects catch up to the major ones. Emphasize on site that they are not a course OR offer a course component for people who want it. Remove or add more value to the yearly subscription. 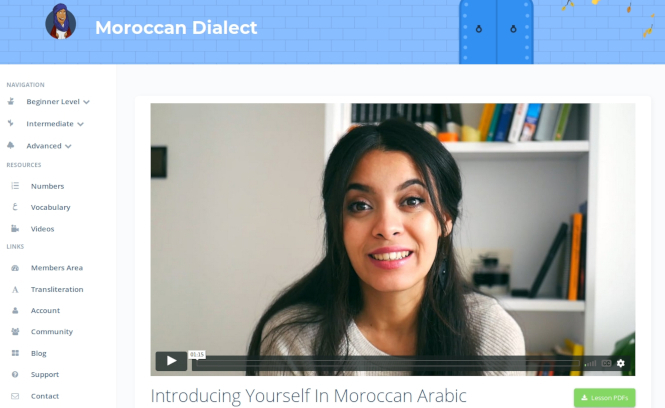 For a resource as big as Talk In Arabic, and one that’s been around for several years now, it’s surprisingly difficult to find feedback by members or former members! Other than the occasional Quora or Reddit question, there still isn’t a whole lot in terms of legitimate and honest reviews. I hope this feedback has been helpful to you (and the Talk In Arabic team).